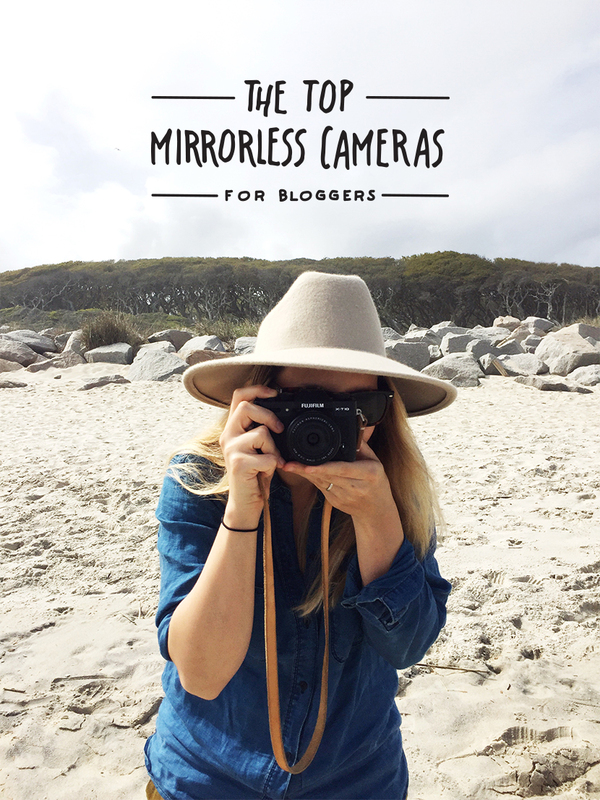 Today we have gathered up the top 5 mirrorless cameras for bloggers. A couple years ago I posted the Camera Essentials for Bloggers, and opened up my camera bag to show you what I shoot with. Many of you commented that, while my cameras were amazing, they were just a bit out of your price range. So last fall Megan and I took a weekend trip to Charleston to test out Canon’s entry level T6i DSLR and see what that looked like. The results were great, and I was really impressed with what is out there for under $1000. 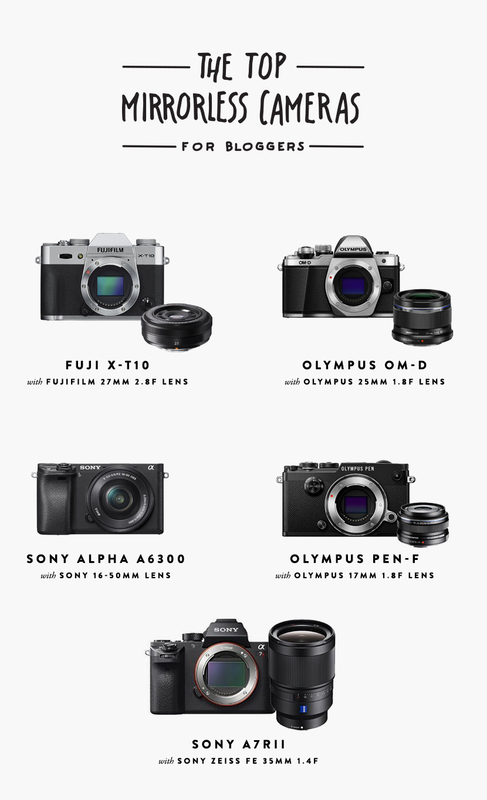 So with all of the new mirrorless cameras coming out, it got me thinking about some more options that I could recommend. Every camera that I have on this list is amazing in some way, however not every camera is going to be perfect for you. Before you ever pick a camera, you need to decide what you intend to do with it, then what you can afford. As with almost everything in life, the more you spend the better the quality. So don’t start with price, start with what you need. Are you shooting primarily still images, video, or a mix of both? Do you need a shallow depth of field, do you need 4k video, and are you traveling with this camera? These are all questions you should ask yourself before purchasing a camera. The list below is in my personal order of preference with details on what each camera will be great at achieveing for bloggers. I did my best to ensure a variety of prices, but all of these mirrorless cameras are worth their price. Price: $898 – $599 for the camera body, $299 for the lens. This is the camera set-up I just bought for my dad. He is a big film camera guy and wanted something that felt like the cameras he had in the 70s. The vintage look and feel of this camera is right on. But the image quality, color, and camera build are better than I expected. This is my first choice for a camera under $1000 that can do almost anything and has a great look. You can change out the lenses, add a hot shoe flash, and shoot almost anything. I was first introduced to this camera from Jeff Sheldon’s trip to Iceland. I could not believe a mirrorless camera could get images and video of this quality. I was blown away by this setup. Like the Fuji XT-10, this camera has the looks and image quality to do it all. I went back and forth between this camera and the Fuji XT-10 and it honestly came down to just being more familiar with fuji film and preferring that color set. This is the best point and shoot video camera for the money. You can get 4k video in a compact camera body and have the options for multiple lenses. If you don’t need 4k video and HD video will do the previous model Sony Alpha a6000 is half the price and quite a camera. The film version of this camera became a style and photography icon in the 1960s. Like the other Fiji and Olympus cameras on this list, the vintage look and feel is right on. However, what sets this camera apart is the 20 Megapixel live sensor and 50 Megapixel high-res raw images this camera can take. IT can also take up to 10 images in a second for high-speed shooting. Which is unmatched for this price. So if you need the high res images, speed, and want a small vintage camera body this is a great camera. In my opinion, this is the best mirrorless camera and lens setup you can buy. If you can afford it. The camera itself is the top Sony a7 series camera with a full frame sensor, 42megapixel raw images, and 4k video with an internal vibration sensor that is near perfection. The Sony Zeiss lens is extremely well reviewed and can shoot at a 1.4 aperture in 4k video. This is seriously an amazing camera. I have rented this camera set up for a couple of shoots and it is every bit as good as my Canon 5D Mark3 and 35mm 1.4f L series lens set up, but with 4k video. What camera do you shoot with for your blog? Any camera you have been dreaming of? I just got the Fuji x100t mirrorless and LOVE it. Fuji is great with color; my photos take nearly no editing now! It’s a 35mm camera, so the lens is affixed, which makes me have to move my feet and is definitely not the way to go for a beginner. the challenge for someone who usually uses different focal lengths is fun though! I recently bought an olympus om-d because i was tired of walking around with 2 kg of nikon camera (i love the big nikon, but it´s not something that i can always keep in my bag!) and i could not be happier! it´s an amazing camera with great quality, very small, very light and very nice as well! ThaNks for this breakDown! Are there any Nikon models you’D recommend? Vanessa – I’m not a good source for Nikon 🙁 when it comes to DSLRs I have always shot Canon so I never really researched Nikon. Let me know what you find! Great Post, sir! I borrowed my friend Kelly Moore’s Olympus OM-d for my trip to China a few months back, and have yet to give it back to her. Ha. I mean, I have offered. I love that I can carry it everywhere, and not have to carry a separate KM Bag for the camera. The only issue I’ve had with it is being too sensitive to light… It could be user error, but i struggle when shooting in full sun. Taylor – you may want to see if the ISO can go down to 50 or 100. If it is on auto that may be what is getting you into trouble. If all that checks out you might want to look at an ND Filter to darken the lens. Good luck! That 6300 is a killer camera for value and size. I’Ve got the 6000 with a 24 and 35 and it covers a huge amount of range. Cant recommend it enough as a srarter through mid level shooting experience. Connor – I hope you have a bike mount for that beast. I was so close to adding that camera to the list. For the money, I don’t think you can buy a better camera. I’ve been impressed and quite happy with my little Olympus PEN. It goes everywhere. Michael – ok can you tell me how the 40+ megapixel images look, it is a better image or just a scaled up regualar image? I have the Olympus OM-D and absolutely love it! So light and easy to use and the photo quality is fantastic! it’s also small enough to fit in most of my handbags unlike my clunky canon 7d. Adrienne – that’s great! I totally agree great travel camera. Hi Mike, great list! Have you tried using your canon lenses with an adapter on the sony camera? Cal – I did try the metabones adaptor and it was super slow and couldn’t track anything moving. It could have been user error, but I wasn’t into the adaptors. I was just going to comment about using the Sony a6000 with older canon lenses. I have a bunch of manual focus canon lenses that I love using with this camera. I have a metabones speedbooster adapter that I use, & it’s really fun to play with. I guess I do have to slow down a bit compared to other lenses and cameras, but the lowlight photos I can get is amazing for someone who doesn’t have a budget for a lot of new lenses! Anyway, I can’t say enough good things about the camera, & Sony has seriously stepped up their game in the last few years. I think Olympus OM-D E-M10 Mark II with Olympus 25mm 1.8f lens or Olympus 12-40mm 2.8f Lens is best for Good Photography.